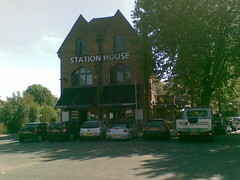 A gastropub near Chiswick Station. bob visited on a Wednesday lunchtime in August 2009. There were a few other customers inside and quite a few outside. The pub has a large area full of sofas and some tables. There is also a section set out for dining. The menu is pretty standard gastropub fare. There were also four or five specials on a blackboard. bob had a decent enough beef burger(£10) photo, although the salad could have been dressed a bit better, as it was drowning in oil with no vinegar to cut it. The chips were pretty well-cooked although they were pre-salted. Food is served daily at 10am-noon (breakfast), noon-4pm (lunch) and 6pm-10pm (dinner). Half a London Pride (£1.80) was okay. The bar menu suggests real ale is £3.40, which makes the price of my half a bit steep. A pint of lemonade and lime was £2.50. Accessibility: All entrances have a step, though the one round the back is quite small. No accessible toilets, but all are on the same level once inside. Last visited by bob, 19 August 2009. Food times taken from the website, August 2009. Last edited 2013-05-10 07:41:43 (version 6; diff). List all versions. Page last edited 2013-05-10 07:41:43 (version 6).